I just love roasted vegetables. Not only are they delicious, but my kids will usually eat them as well. This roasted broccoli is so easy. It’s a great one to do with your young kids. Mine had fun shaking the bag around. 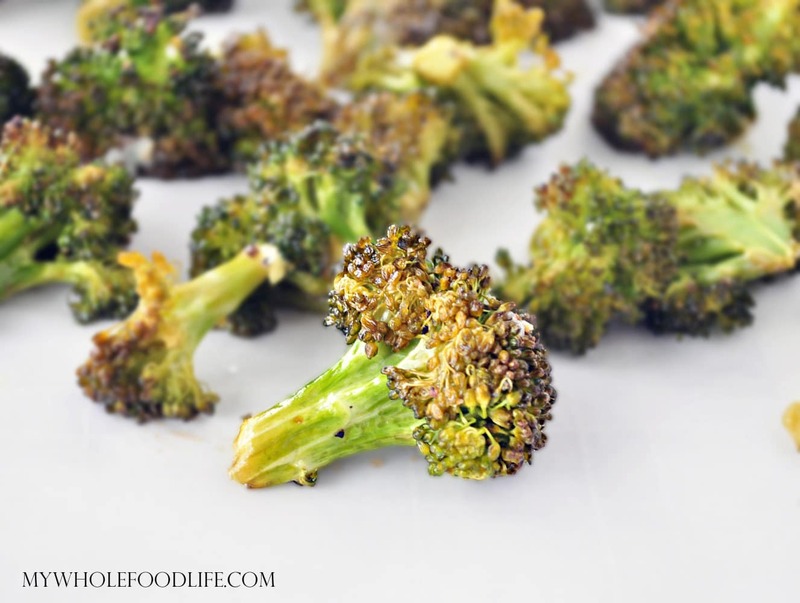 This roasted broccoli recipe is almost fool proof! If you like this, then you may also like my Cauliflower Popcorn. An easy side dish that everyone will love! Add the broccoli and the remaining ingredients to a Zip-Lock bag. Spread broccoli on a lined baking sheet. Bake for 25-30 minutes, stopping once to turn the broccoli over. The broccoli will shrink down quite a bit after cooking. If you have a large family, you may want to double the recipe. My family loves this too. I add a little shake of red pepper flakes for a little heat. I have been roasting my broccoli and other veggies like this for several years on a large sheet pan from Gordon Foods restaurant supply. I like the easy clean up, but was recently reading that I should be avoiding aluminum. I noticed you had a liner on your sheet pan. Could you tell me what kind? Great recipe. I love roasted broccoli and cauliflower. One thing you can try adding is just a touch of sugar...perhaps 1/2 teaspoon? It provides just a slight hit of sweet and it aides in caramelization. Cheers! This is SO delicious. I have done something similar with both broccoli and cauliflower, except sprayed olive oil in a Misto and sprinkled on the seasonings. I eat it with my fingers off the cookie sheet right out of the oven. I can't even wait to get it on a plate it is so good. I agree! I could sit there and eat the whole tray! Hi. This looks great. I am going to try this tomorrow. Do you think I could do this with mushrooms and onions as well? Thanks! Thanks! I think you could. Let me know if you try with mushrooms and onions. Hi. I ended up not trying the mushrooms and onions. I made your broccoli and it was delicious! I added a little extra garlic, lemon juice and put a few shakes of red pepper in because I love these ingredients. I am normally a meat and potatoes kind of girl, but you have turned me! I am going to make this again next week, but will probably roast 3 crowns of broccoli! Thanks! Oh yay! Glad you liked it! You are so welcome! I am so glad you enjoyed it. We do this with asparagus too! So good! Oh yum! I will be trying that soon! Love that spring is finally here! We do this with cauliflower all of the time - cant wait to try it with broccoli! Yummy! Thanks! I have done it with cauliflower as well. So good! Cauliflower is also excellent done this way - adding a little all seasoning paprika based spice olive oil goes rancid over 250 degrees F... thus we use grapeseed oil. agree. I have done that as well. Yummy! I do the same thing but I grill it. In the grill it only takes a few minutes. Just grill on low and turn it after 4 minutes or so depending on your grill. Grill another 3 or 4 minutes and it is done. We like it with a little bite to it and it gets that wonderful smoky grill flavor. It is so good that I often have just a bowl of grilled broccoli for dinner. I like to marinate it a few hours before grilling so all the flavors melt into the broccoli. You have to try it grilled!